>> CLICK HERE to read the full review. 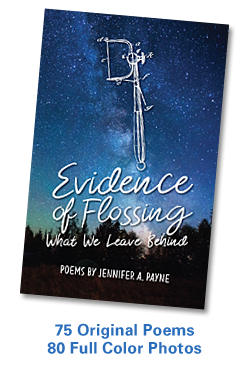 This review is part of a month-long, nationwide blog tour for my new book Evidence of Flossing: What We Leave Behind, hosted by Wow! Women on Writing. Buy the book today! This entry was posted in Books, Creativity, Ecospirituality, Mindfulness, Nature, Photography, Poetry, Spiritual Ecology, Spirituality, Writing and tagged Book, Books, Branford, Connecticut, Cosmology, Creativity, Ecospirituality, Jen Payne, Mindfulness, Nature, Photography, Poetry, Spiritual Ecology, Spirituality, Storytelling, Writing. Bookmark the permalink.